It’s simple but yet can be sophisticated, fits any taste and budget and each season brings new flavours and aromas. You guessed right, this time we are going to talk about food, and precisely about food events and food travel for groups. Italian cuisine doesn’t need an introduction; it’s famous worldwide, dominates big metropolis and present in every household. But no matter how “homemade” one’s dish might be, the true essence of Italian cuisine can be found only in Italy. Each season and each region bring an array of products and aromas available only for a short period of time, making it necessary to plan the travel timely and carefully not to miss any highlights. We handpicked three regions best known for foodie experiences in Italy and were delighted to also interview Francesca Montillo, Owner & Founder of the Lazy Italian Culinary Adventures. Since 2016 the US based native Italian inspires American travellers to discover Italy through food, culture and traditions and experience Italy like a local. Italian Special Occasions DMC has been collaborating and supporting Lazy Italian Culinary Adventures on designing culinary programmes to Italy. From our first phone call our relationship was off to a good start as we found out that we both share the same philosophy and values. We believe that Italy should be discovered off season and off the beaten path, and that Italian food can be THE experience, and not just part of it. We are proud that we can deliver our clients knowledgeable and hands-on expertise about the individual regions and their produce and nothing can describe this trip better than the saying goes “the way to a man’s heart is through his stomach”. Here we picked three regions for you to discover for foodie group adventures followed by Francesca’s interview. Puglia is surely the destination of choice for savvy food enthusiasts who want to come for cooking classes, food and market tours, food festivals, harvesting of olives or wine and dining experiences. It offers the best of the best from the sea and from the land. We encourage wellness and wellbeing, so delegates will be also able to integrate some sportive activity, such as cycling in the city or through the olive groves, walking tours or even horseback riding. Delegates will discover the region through their five senses and learn about the typical products from Puglia, such as the Burrata, the red onion of Acquaviva delle Fonti, taralli, friselle and the list goes on. They will be even able to make traditional Orecchiette with a local. Most famous for its beaches, food travel might not be what you associate the region of Calabria with, but it’s indeed a foodie destination, being known for its rather spicy cuisine. 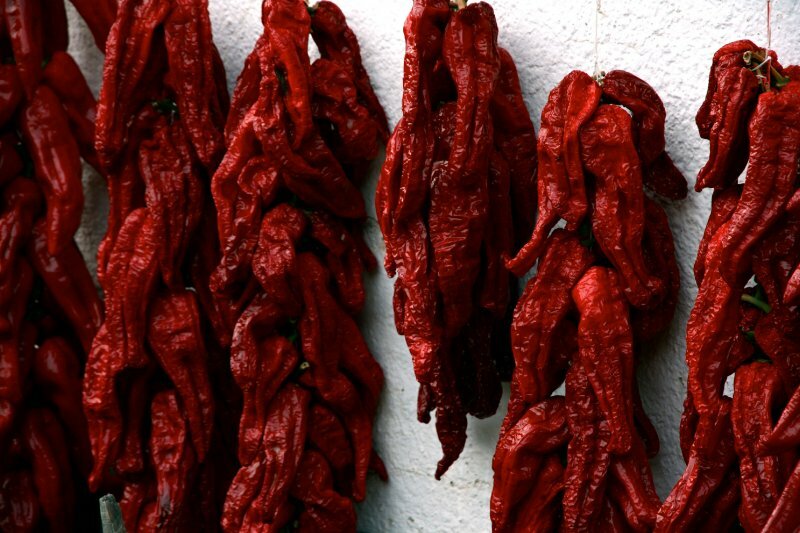 The red pepperoncino is originally from Calabria, along with extra-virgin olive oil, wines, bergamot liqueurs, liquorice, citron and herbs, honey and jams. In comparison to the active stay in Puglia, in Calabria you might consider giving your delegates to choose between staying lazy on the beach or engaging in one of the water activities such as windsurfing, kite-surfing or scuba-diving. If the sea is not an option, Calabria has also mountainous regions where you can organise an orienteering team building activity, for example. The teams will be given a map and a campus to reach their destination in the shortest time. The final goal can be a surprise dinner location, and on the way there delegates can have mid-way stops to pick ingredients for the dinner or have appetizers or wine tasting to learn about the local products. Probably the most famous out of the three for foodie travel, we couldn’t have omitted Bologna from that list. We’ve written about Bologna already in the past but can’t emphasize enough how much we love all the local products coming from this region: tortellini, lasagna and tagliatelle al ragù, mortadella and parmesan, and popular wines like Pignoletto, Lambrusco, Alionza and Negretto. Here you can visit a parmesan factory, a prosciutto factory, balsamic operation or any local shop or market and have tastings there. Bologna is also a cultural hub, with the older university in Europe, the famous Motor Valley, various museums and art galleries and the famous Basilica di San Petronio. Now we are delighted to share with you the interview with Francesca and her journey as she turned her passion to her full time job. Can you tell us a bit about yourself and your company Lazy Italian Culinary Adventures? I moved to the U.S. when I was 10 years from a small town in Calabria. I always loved our return trips growing up and always knew I wanted to start a business that revolved around Italy. Unfortunately, starting that business took longer than I thought. I started working in corporate America and the business took a back seat. Unfortunately “corporate America,” as they say, doesn’t give nearly as much vacation time as I liked and my return trips were always far shorter than I wanted them to be! So in 2016, I finally took the plunge and started my own business leading tours there. I focused on food and wine because frankly, I wanted to focus on what I knew best! I love cooking, I now even teach Italian cooking so focusing on what I liked and knew best seemed obvious. It’s what is most authentic to me, and what comes naturally. Your business is all about cooking and food tours. What inspires you when you plan your events – the flavours, the local people, the seasons etc.? It’s very easy to be inspired by Italy and the cuisine. Each season brings with it its own bounty, especially for produce. I am as thoughtful about selecting the regions as I am about the time of year. For example, this year, we’re headed to Puglia, Calabria and Bologna. For Puglia and Calabria, we’re there when it’s peak season for nature’s bounty of zucchini, eggplants, tomatoes and green beans. 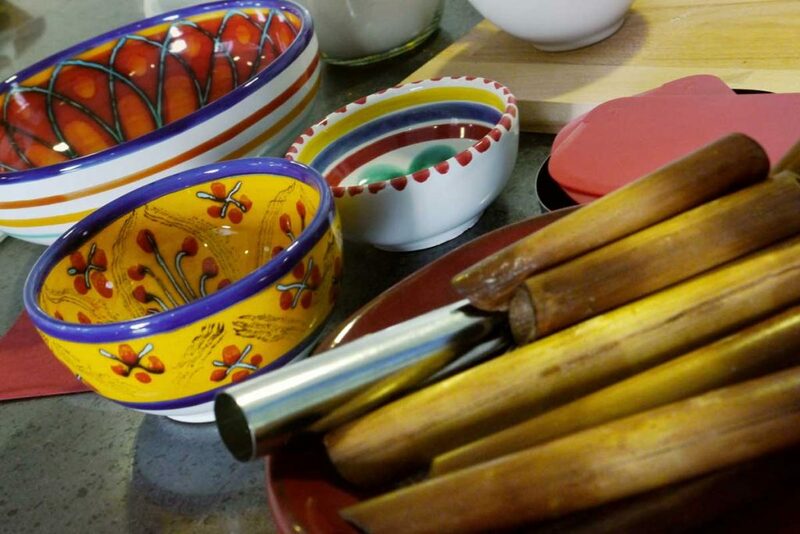 These are sure to make for wonderful meals during our cooking classes. I can’t wait to show my clients the zucchini blossoms, something almost never seen here in the statues. They are one of my favorite summer treat when in Italy. It will be wonderful to bring a group back to my native Calabria, something I have wanted to do for a long time. I return every year during the summer and always knew it would make a great group destination. For Bologna, we’re headed there in October, when we will be feasting on some seasonal mushrooms, perhaps fresh pressed olive oil and maybe even chestnuts. 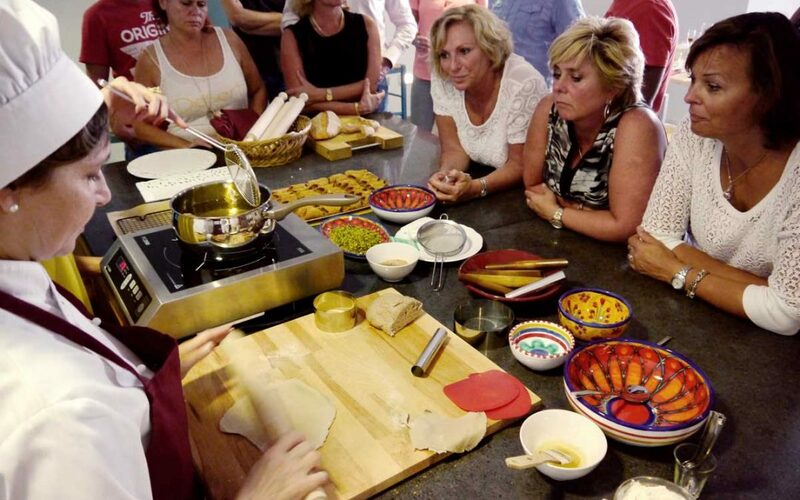 How do you choose the Italian destinations for your cooking classes? What influences your decision making process? I vet all my suppliers carefully before making a final decision on who I will work with, because ultimately, as a tour leader, I am only as good as my suppliers. They really make my business what it is, so it’s of outmost importance that they have a good relationship with my clients. They can make or break a trip and the clients hold me accountable for that, as well as they should. When possible, I meet the collaborators in person, when not, I have several Skype interviews. I basically interview them and thankfully, they are used to that. I like small, family-run businesses, nothing mass-produced. Whenever possible, I like in-home cooking classes as oppose to large cooking schools. I love small shops, whole in the wall places. Nothing you would find easily on the internet. What’s currently trending on the food scene? As a culinary instructor, I continue to get frequent requests for gluten free recipes! I have actually had a few inquiries form possible travelers who ask if my tours are a good option for a gluten-free diet! They are not right now, but I may have to design a tour just for the “gluten free” traveler as that is definitely trending right now! It’s the same for vegans. Folks are becoming healthier, learning more about the health benefits of a gluten free diet or vegan diet, so I anticipate that as tour leaders, we will have to adapt to that in the near future. We’re headed to Calabria, Puglia and Bologna later this year. The theme is obviously the same for each tour, that is great food and wine! In Calabria, we’re visiting one of the best wineries from the region, we’re going to a fish market and selecting our fish for a cooking class, we’re also having lunch on a boat! We’re staying right on the beach in a lovely B&B in Tropea. 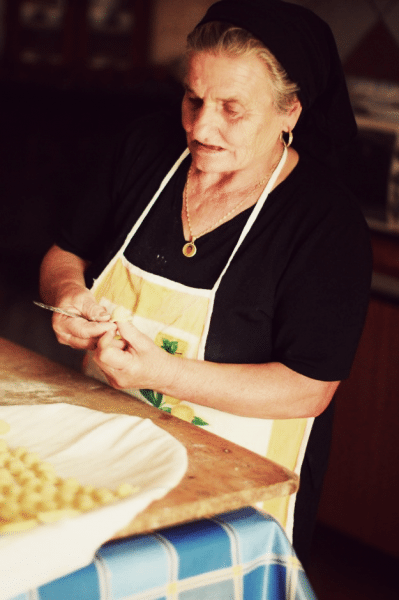 In Puglia, we’re making orecchiette with Pugliese moms, learning all about “cucina povera,” visiting an enoteca, learning about southern wine. Of course, we will also see the famous Trulli! As a major foodies, I’m excited to be heading to Bologna in October. I’m looking forward to bringing the group to the Parmigiano factory, the acetaia and of course, a prosciutto producer. These items are very common in the US so it will be great to show the group where their favorite foods are coming from! Of course, we’re also learning to make tagliatelle from scratch with their famous Bolognese sauce. 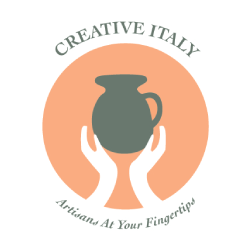 What’s your “recipe” for a successful event/ tour in Italy? I admit that when I started, I was far more “uptight” and concerned with perfection. Everything had to go according to plan, and every minute was planned accordingly. Now, I am more laid back and I think the clients actually appreciate that. As a tour leader, I must be fluid, anticipate problems as best I can but recognize that issues will come up. The driver will be late, it will rain during a scheduled picnic and plans might not go as expected. The key is to show clients that we travel as a small group for a reason, so we can make arrangements and changes as needed. Ironically, the clients are more open to changes in the itinerary than I am. I try to give them exactly what they signed up for, but they are open to adjustments. The perfect tour has the obvious components, great food, wine, company but more than that, it builds relationships with the other travelers, it opens up their eyes to other cultures and it builds memories. Why should you embrace seasonal travel?